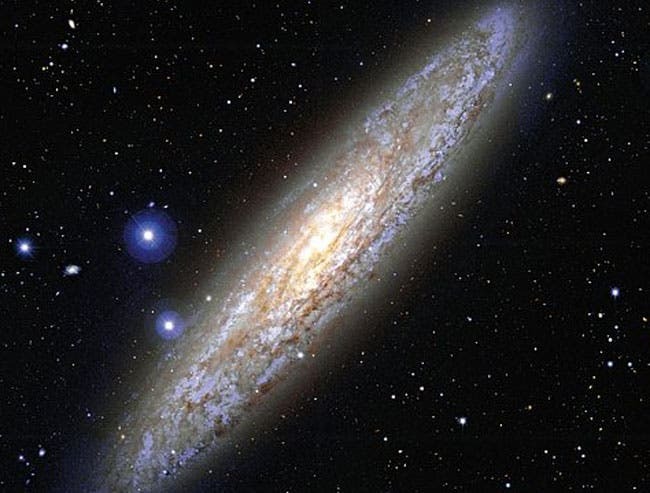 Astronomers concluded that the center of the specatacular spiral galaxy, NGC 253, the largest member of the Sculptor Group of Galaxies, the nearest group to our own Local Group of Galaxies, hosts a twin of Sagittarius A*, the bright radio source that lies at the core of the Milky Way and which we know harbors a massive black hole. The scientists combined their NACO images with data from the infrared instrument on Chile's Very Large Telescope (VLT), as well as with images from the NASA/ESA Hubble Space Telescope and radio observations made by the Very Large Array and the Very Large Baseline Interferometer. Combining these observations, taken in different wavelengths, provided a clue to the nature of these regions. "The black hole [Sag A*] came into existence billions of years ago, perhaps as very massive stars collapsed at the end of their life cycles and coalesced into a single, supermassive object," according to Andrea Ghez, professor of physics and astronomy, UCLA. For years, astronomers speculated that a giant, mysterious force lay at the center of the Milky Way 26,000 light years or 158 trillion miles away, but it wasn't until recently that definitively showed what it was. Ghez's research focuses on the origin and early life of stars and planets, and the distribution and nature of the matter at the center of our galaxy. Using new techniques for peering into the dusty heart of the galaxy, Ghez's observations proved that scores of stars were rapidly orbiting what could only be a black hole. But it wasn't the kind of garden-variety black hole created when a star explodes and dies; it was hundreds of thousands of times as powerful – a "supermassive" black hole – at the center of our galaxy. Black holes are collapsed stars so dense that nothing can escape their gravitational pull, not even light. Black holes cannot be seen directly, but their influence on nearby stars is visible, and provides a signature, Ghez said. The supermassive black hole, with a mass more than 3 million times that of our sun, is in the constellation of Sagittarius. Our galaxy's core Black Hole is called Sagittarius A*, or Sgr A*, located due south in the summer sky. What's inside a black hole is one of the biggest mysteries in physics. Einstein's general-relativity theory that predicted black holes in the first place says that all the matter inside them gets squashed into a central point of infinite density called a singularity. But then, "things break down mathematically", says Christian Böhmer of University College London, in the UK. When matter gets swallowed by a black hole, according to a radical new theory proposed by Bohmer called quantum loop, it could fall into another universe contained inside the black hole, or get trapped inside a wormhole-like connection to a second black hole. Since 1995 Ghez has been using the W.M. Keck Observatory's 10-meter Keck I Telescope atop Mauna Kea in Hawaii – the world's largest optical and infrared telescope – to study the movement of 200 stars close to the galactic center. She has made measurements using a technique she refined, called infrared speckle interferometry, and for the last few years, an even more sophisticated technique, called adaptive optics, a new laser virtual star, which enables her to see more of the densely packed stars in this region. Twenty stars near the galactic center are orbiting ever closer to the black hole at a blinding speed of up to 3 million miles per hour about 10 times the speed at which stars typically move. Her discoveries, along with the work of scientists studying other galaxies, have led astronomers to the surprising conclusion that most, if not all, of the universe's hundreds of billions of galaxies have supermassive black holes at their core. Even more striking, the astronomers have found that the black holes' mass and nature are closely related to the size and makeup of the surrounding galaxies. Ghez earned her Ph.D. from the California Institute of Technology and her B.S. from the Massachusetts Institute of Technology; she was a Hubble Postdoctoral Research Fellow at the University of Arizona's Steward Observatory. She joined UCLA's faculty in 1994. Black holes appear to be both creators and destroyers, swallowing stars or gases that come too close while also spewing out jets of super-high-energy particles and radiation generated by this violent feeding process. The jets, which can be millions of light-years in length, are believed to seed galaxies with the mass and energy that will, in time, become new stars and perhaps even planets. Ghez and UCLA colleague Mark Morris, a professor of physics and astronomy, reported the detection of remarkably stormy conditions in a hot plasma being pulled into Sagittarius A*. This detection of the hot plasma is the first in an infrared wavelength, where most of the disturbed plasmas energy is emitted, and was made using the Keck II Telescope. Plasma is a hot, ionized, gas-like matter, a fourth state of matter – distinct from solids, liquids and gases believed to make up more than 99 percent of the visible universe, including the stars, galaxies and the vast majority of the solar system. The supermassives are drawing astronomers and astrophysicists back into black hole research. In 1915, based on purely theoretical calculations, Albert Einstein laid the groundwork for the existence of these bizarre phenomena, which have such strong gravitational pull that not even light can escape them. But research on them languished for decades because there was no way to observe them directly. The Hubble Space Telescope provided the first real evidence of the existence of super-massives, revealing in 1994 that something was orbiting rapidly around the nuclei of some distant galaxies, suggesting the presence of a huge mass contained in a very small area. Since then, the Hubble, NASA's orbiting Chandra X-Ray Observatory, the Keck and other very large, high-resolution ground telescopes have begun to unravel more about these central black holes. Mysteries abound. Many researchers have offered theories of how supermassive black holes might have formed, but there is no consensus. Were they created in the early universe when exploding stars were larger, or are they created by the merger of galaxies with smaller black holes at their center? There is also the puzzling question of why some are active – feeding regularly on stars around them – while others are nearly dormant. Ghez added to the mystery recently by reporting that some of the stars orbiting the Milky Way's central black hole are quite young, even though the galaxy is mature and its nucleus has long been dormant. But dormancy can be temporary, as Suvi Gezari of the California Institute of Technology documented recently. Using the telescope on NASA's orbiting Galaxy Evolution Explorer – which measures ultraviolet light from the early universe – her team detected a distinctive flare from a distant galaxy and watched it diminish over time. They concluded that they had seen an unfortunate star stray too close to its galaxy's central black hole, where the star was torn apart and then swallowed by the force of its gravity. The bright flare – a rarely witnessed event – was the result of this "feeding." "Most of these are sleeping cosmic beasts, just sitting there," Gezari said. "So we have to scan the skies to see those very rare times when there's a burst of radiation as the black hole feeds." The image below of our Milky Way galaxy's core reveals a star-forming region as recorded at several wavelengths invisible to the eye. Red indicates radio-wave emission, green indicates radiation in the mid-infrared, and blue is X-ray emission. The arrow indicates the super massive black hole at our galaxy's center with a mass of about 2.6 million times the mass of our sun. Q. Daniel Wang, U. Mass.